There are a whole range of battery chargers available in the shops made by different manufacturers, the Duracell Battery Charger is under review here. We bought the item from an online store, and with it came two AA batteries – they type which go in XBox hand controllers amongst many other things. (The actual charger takes up to four of these). Switch on power to charger (if you have switched sockets that is). How simple to use is this? It doesn’t get any better in our view, as the charger automatically stops charging the batteries once they are full – unlike some cheaper ones which we won’t discuss. The lack of a progress bar of some kind like those sometimes shown on the LCD display chargers is not a problem for me, although some people may prefer to know how far through the charging process their batteries are. In this case the Duracell charger shown here is not for you. There is a lot of speculation about batteries and how they should be fully charged or they “forget” and don’t perform as well as they could, given this information at brand and actual battery size level is not readily available, the preferred method is to fill em up and go, rather than dither with half charged batteries. Again, and really this is personal preference, this charger comes with no leads, so it fits straight into the wall socket – or does it? In most situations it will – however there are probably a few odd socket installations where it may be difficult or impossible to fit – as it is taller than the socket itself – so if the socket you intend to plug it into has anything immediately below it, you may run into problems and have to fit it elsewhere. 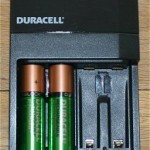 If there is a fault at all during charging, the fixed/steady red light (indicating charging) on the Duracell battery charger shown here will begin to blink. When this happens I tend to dispose of the batteries and buy new ones. 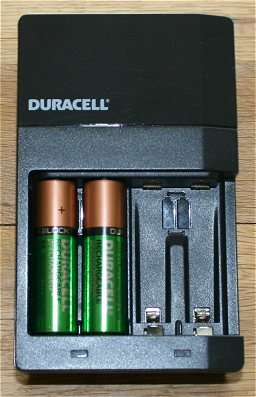 Inserting the batteries is also a bit fiddly – this is because the moulding accepts different sizes, for AA batteries the easiest way is to press the bottom of the battery in and then the top, for the smaller AAA types, the top of the battery is better inserted first, followed by the bottom. Just the way they click into place and its no big deal but you may need to remove the charger from the wall to insert the batteries easier than if the charger is left in place. Overall – a great charger – lacks features but does the business and I would buy again without any shadow of a doubt should the need arise.